Hello Gorgeous: Balls O' Beauty. 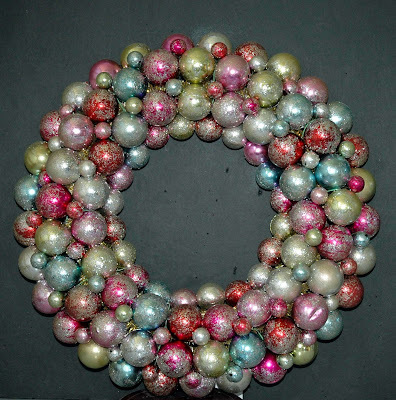 I collected old christmas balls from the local thrift shops and made a wreath like the bottom one. 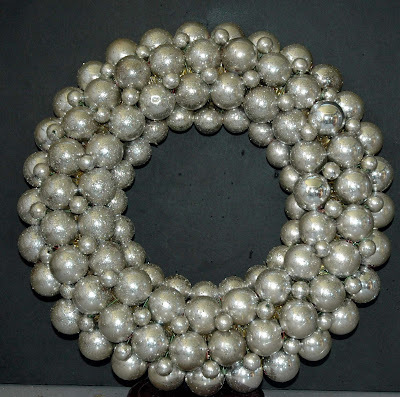 Glue-gunned 100's of balls onto a wreath form. Hung it on my front door. Storm came through. The colour on the balls dissolved and all of the balls fell off and smashed. I was very sad. That's an incredible deal for those! The would also make pretty centerpieces with a great hurricane in the middle. It's visions of sugarplums! They're like gingerbread house decorations! I love em! These are gorgeous and surprisingly inexpensive!! David, yes I do know. I had a tag for this post for you which I forgot and will now add. I love them. Thanks for the post.